Hey folks, Harry here... Since running that clip I've had dozens of ILMers emailing me about the production and what an epic film they would have made it if given the chance. Also there were a lot of myths about the film that were... taken away. 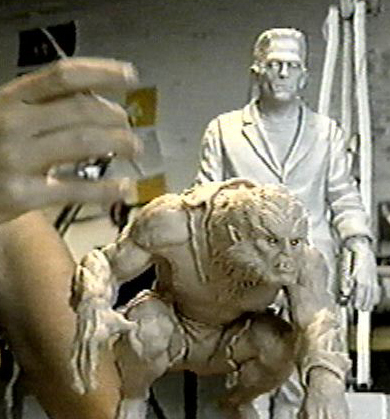 First off, this was... by no means... to be a remake of FRANKENSTEIN using CGI. This was called FRANKENSTEIN VS THE WOLFMAN and was to be a horror film and was to be scary. The comedic aspects that came in, were brought onto the script by the nimrods at Universal that clusterfucked the whole deal. Trying to DISNEY-fy the whole thing. Tis a shame really, this last Saturday I threw my 2nd SATURDAY MORNING FILM FEST for kids at the Alamo Drafthouse where I showed a room filled with children... literally packed with them... FORBIDDEN PLANET, but before that, I showed a special I have in 16mm called MONSTERS WE'VE KNOWN AND LOVED that was narrated by Joseph Cotton and detailed the history of the Horror film up until 1965 or so. You should have heard those kids' "ewwwwwww" and "aaaaaaahhhhhh" at the ol Boris Karloff FRANKENSTEIN and MUMMY... as well as the Lon Chaney Jr WOLFMAN. In fact during the section on Universal Horror films, there was this little 6 year old sitting near me, that had their hands up on his face, and was looking out from between parted fingers... mouth hung open and a smile creeping out. Meanwhile the adults in the room were loving it. Universal's execs... a buncha geniuses I tell ya! 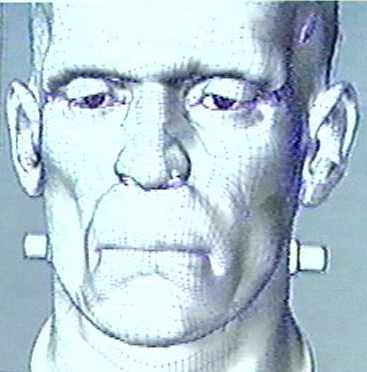 Inspector Kemp here, and I wanted to thank you for keeping your readers aware of the tragedy that was "Frankenstein" at ILM. As a way of showing my thanks, I'll include some nifty tidbits about the movie. A lot of us ILMers are bitter about this project being canned, and I am grateful that others are upset as well. This would have been revolutionary filmmaking. As I'm sure you're aware, the SIGGRAPH test footage was in color, not the b&w that appears on your site. I noticed that you did not include the amazing soundtrack by Gary Rydstrom, which is a shame. Gary was also going to design the sound for the film. That man is genius. There were to be 2000+ shots on "Frankenstein vs. 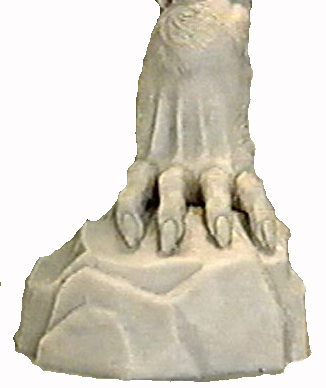 The Wolfman", as we called it in house. From the very start, this project was doomed. I was told that if the project wasn't green-lit, many would be out of a job (they were anticipating huge layoffs as SW1 wrapped), which is what happened despite the green light from Uni. The hope had been that as folks wrapped their work on SW1 (or the Mummy or Sleepy Hollow), they would move on to "Frankenstein". No such luck. There have been some great animators who have been let go, protegees of Steve "Spaz" Williams and the like. There were several shots that we were asked to axe by Universal, including the opening scene with the Wolfman in the town fountain. Why? Because 'water is too expensive to CG'. !!!! The script had some "issues", such as the late appearance of the monster, and a character called Novo...you think JarJar is loathed-! I blew it off when Frank Biondi got fired. But then "Babe: Pig in the City" bombed and Casey got the boot, too. It was all downhill from there. Casey had helped bring David Bowie on board as the voice of Dr. Pretorius. With Casey gone, the casting was dubious. The guy who played Harold in "Harold & Maude" was up for the voice of Novo, as well as one of the ladies from "Rugrats". It was hard to get things nailed down. First the release date was August 2000, then it was pushed back til Halloween 2000 (a better choice IMHO). We were all committed and looking forward to working on this project, now many of us are seen working with pygmy skeletons and a scorpion king. HA! It is such a shame that this movie will never be made. You try and shrug it off and say "that's show biz", but it's really a revelation of the dark, stupid forces that run Hollywood.